Regular readers might be tired of hearing about my colorblindness but since new friends are always stopping in I’ll tell the story again as briefly as I can. In a nutshell, I have a very hard time seeing red in nature and it’s bad enough so a male cardinal disappears when he lands in a green tree. In spring when the trees are leafless and at this time of year when they’re falling I have an easier time of it, and right now I’m seeing red everywhere. 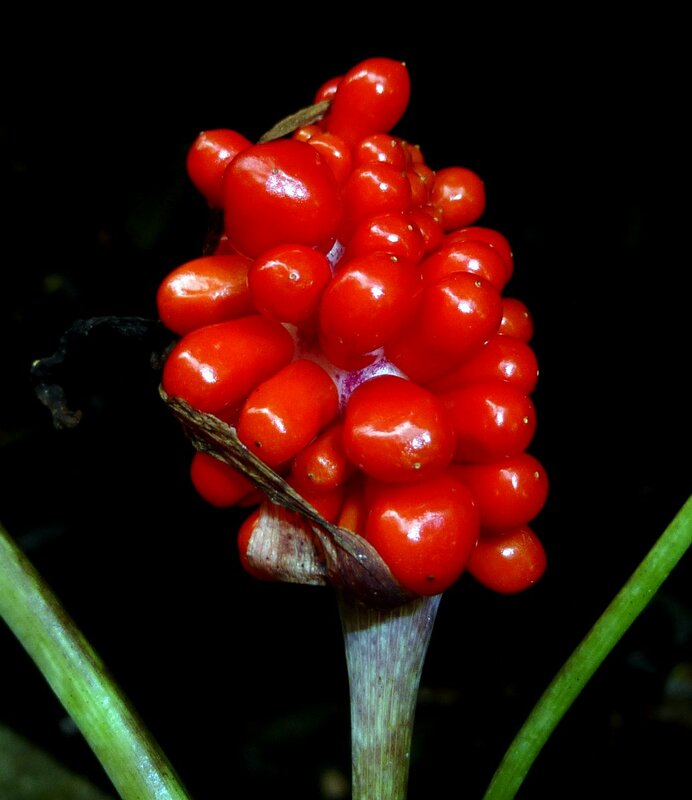 The above shot is of the ripe fruit of a Jack in the pulpit (Arisaema triphyllum,) a native plant in the arum family similar to the Lords and Ladies plant found in the U.K. Deer often come by and chomp off the top of the plant so I was happy to find this one. Each berry starts out green and contains 3-5 seeds. It’s hard to describe the size of things that I find and I’m sure people must have a hard time visualizing the tiny size of slime molds. 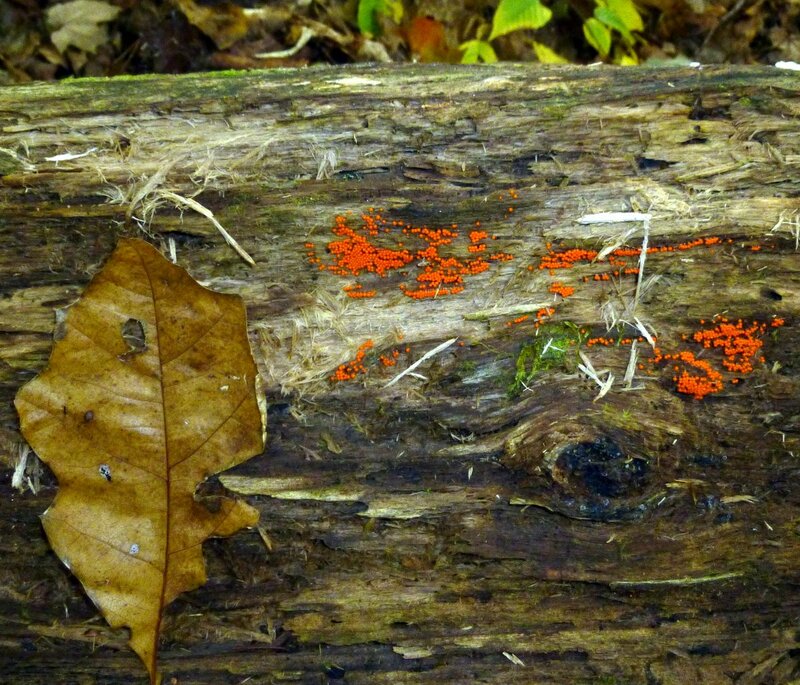 As the photo shows, each tiny reddish dot on the log would fit into a space about a third of the size of the oak leaf. I think this slime mold is Trichia decipiens, which starts out white and then turns red or pink, yellow, green and finally brown. Each red-orange sphere stands on a tiny stalk (unseen.) When this slime mold is in its plasmodial stage as shown all of the fruiting bodies move together as one to a food source. Food for them means spores, protozoa, or decaying plants. 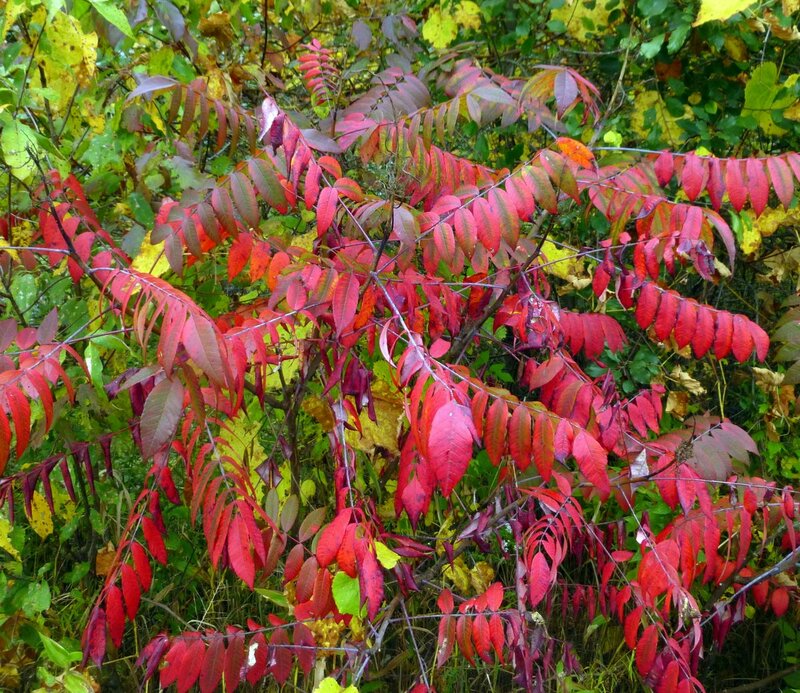 My color finding software sees brick red, Indian red, firebrick, crimson, tomato, pale violet, plum, and even hot pink in these staghorn sumac leaves (Rhus typhina.) Staghorn sumacs can be seen along the edges of many fields right now. Interestingly, the same colors are found on this pouch gall that grew under the leaves of a staghorn sumac. These galls start life looking like a peeled potato but turn red as they age. They are created by a wooly aphid called the sumac gall aphid (Melaphis rhois.) Female aphids lay an egg on a sumac leaf and the leaf forms the gall around the egg, and winged females leave the gall in late summer to complete the cycle. Science has found that this relationship between aphid and sumac has been going on for at least 48 million years, with no signs of stopping. 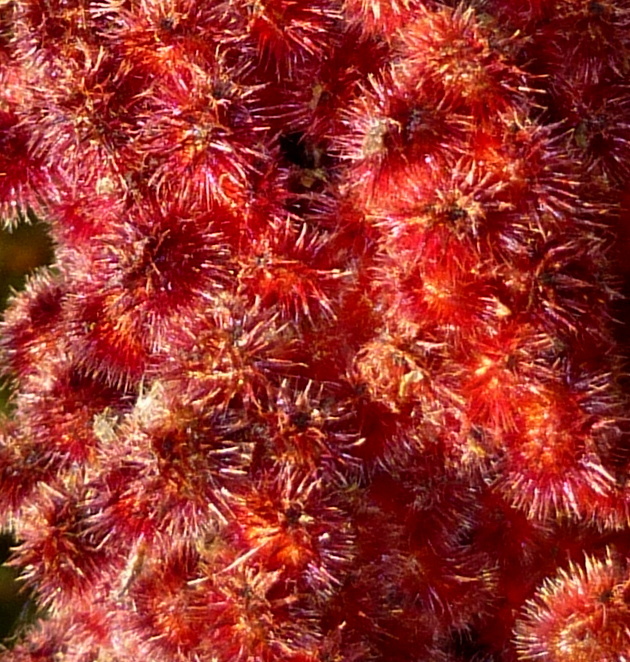 Staghorn sumac berries are also very red and very fuzzy. A drink that tastes just like lemonade can be made from these berries. It was a favorite of Native Americans. 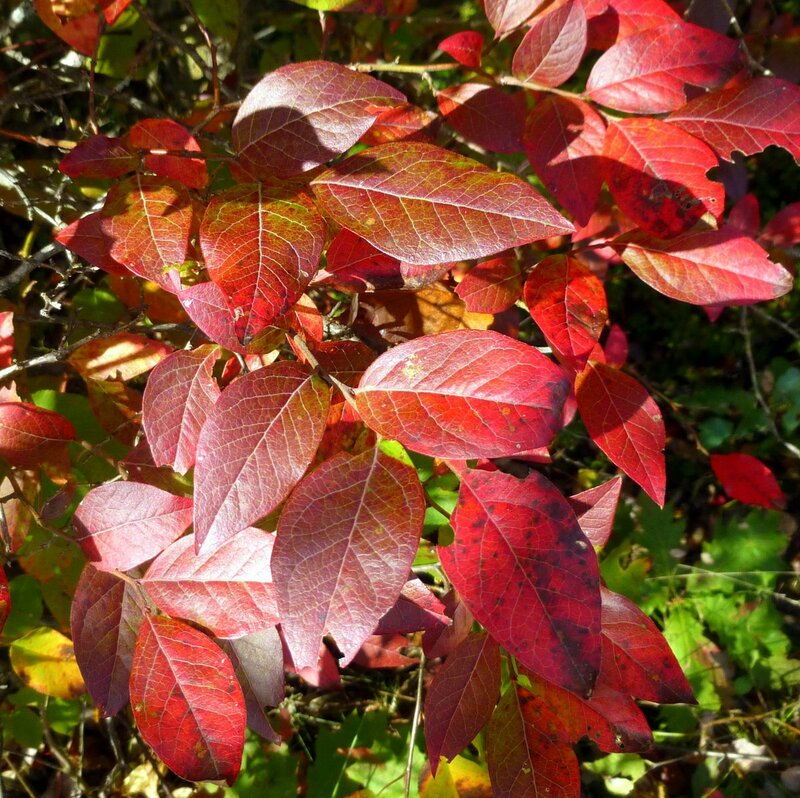 Native highbush blueberry (Vaccinium corymbosum) leaves turn very red in the fall. Blueberries line the shores of many of our lakes and ponds and also grow on many of our treeless mountain and hill tops. 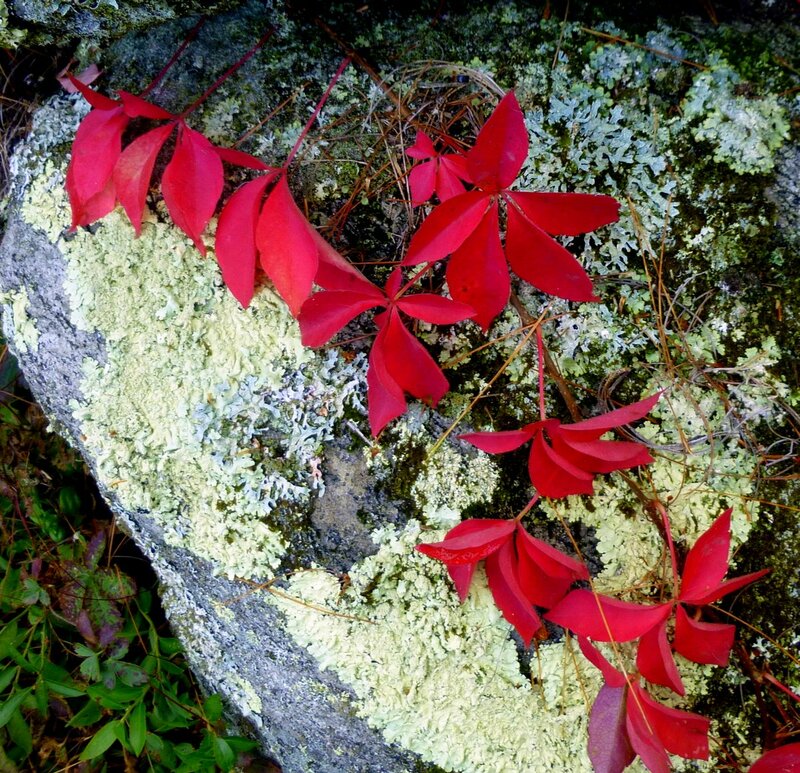 A young Virginia creeper (Parthenocissus quinquefolia) crept over a lichen garden and I couldn’t resist taking its photo. 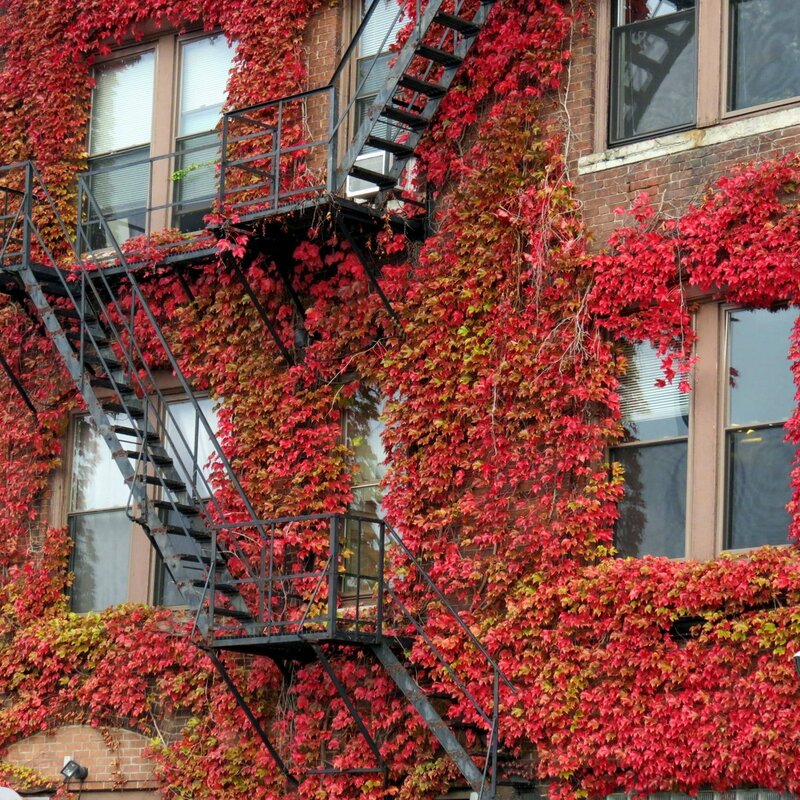 Boston ivy growing on the rear wall of a Keene building built in 1893 has turned very red. Generally vines grown on brick or stone don’t cause much damage, but the mortar used in buildings built before the 1930s might not contain Portland cement and may have weakened over the years. Boston ivy attaches itself using tiny circular pads that form at the ends of its tendrils and secretes calcium carbonate to “glue” the pads to the surface it wants to climb. The glue can to hold up to 260 times its own weight and if pulled off brick walls could pull the mortar along with it. Boston ivy has nothing to do with Boston; it’s really from eastern Asia, and it isn’t a true ivy. 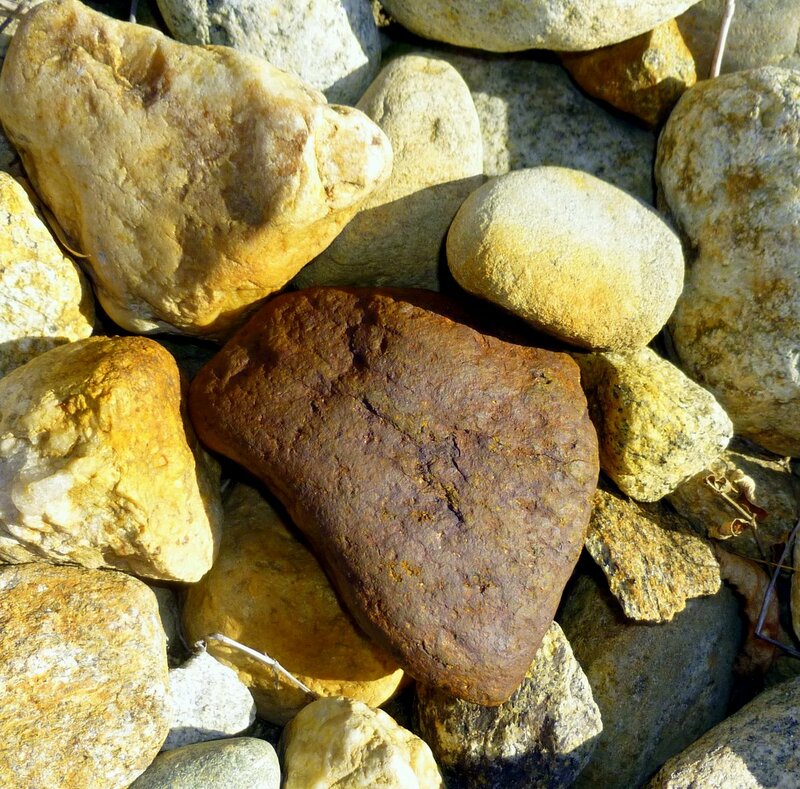 Stones with a high hematite content can be very red due to oxidation. Hematite is iron ore and it will rust, as this photo shows. It has even stained the surrounding stones. Red hematite powder was found scattered around the remains at a grave site in a Zhoukoudian cave complex, near Beijing, China. The site has evidence of habitation from as early as 700,000 years ago, so humanity has valued the color red for a long, long time. Rose hips always remind me of tomatoes for some reason. They contain higher amounts of vitamin C than oranges and are very nutritious, but their tiny seeds have silky hairs on them which have to be removed before they are used. The hairy seeds are used in itching powder, so you can imagine how irritating they’d be if you ate them. 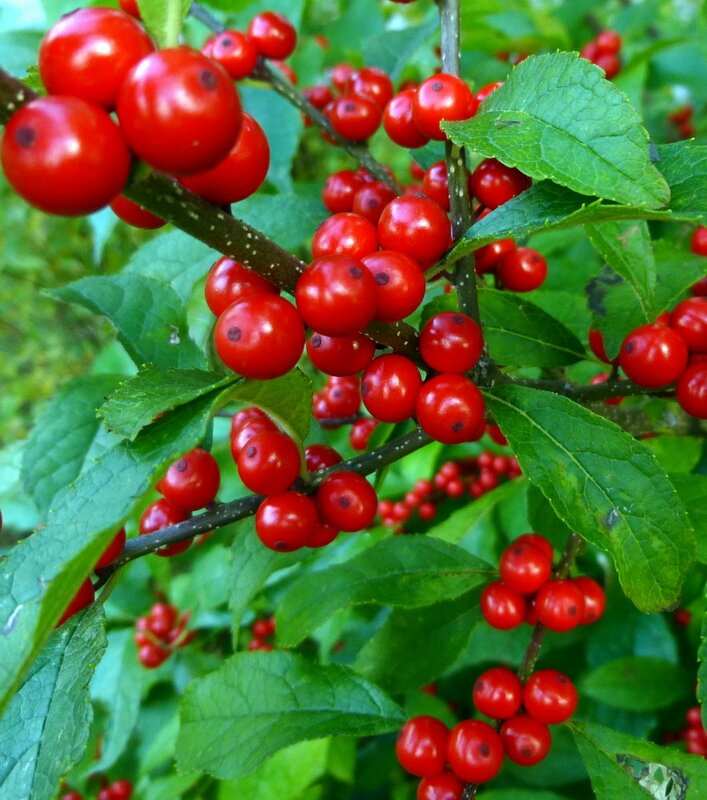 Winterberry shrubs, a native holly (Ilex verticillata,) are outdoing themselves this year and are loaded with fruit. I almost wish it would snow so I could see the red and white together because they are especially beautiful after a snow storm. I think I can wait a month or two to see it, though. Cranberries (Vaccinium macrocarpon,) along with the Concord grape and blueberry are one of three fruits native to North America that are commercially grown. Because they float commercial growers flood their fields to make harvesting easier. 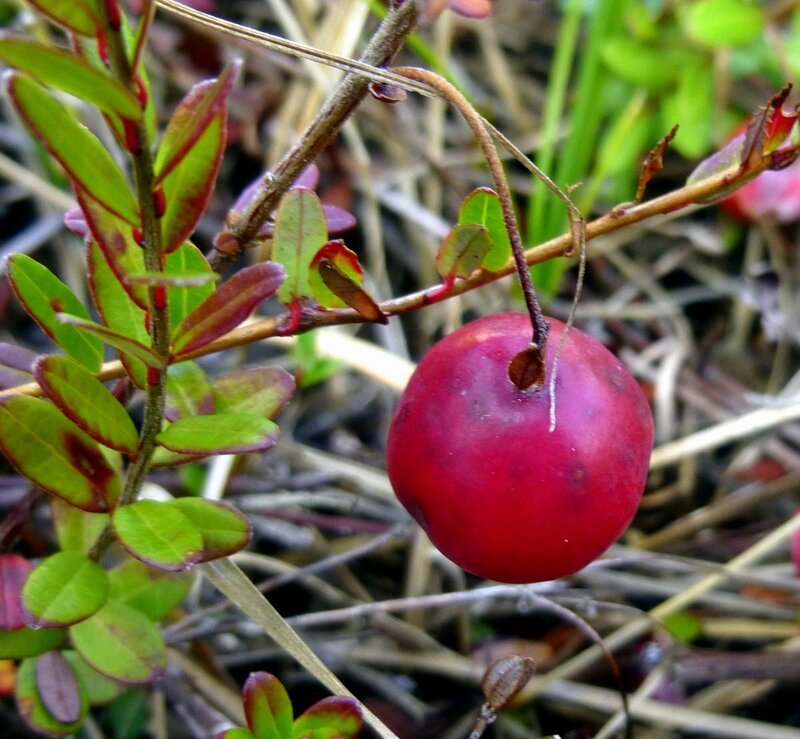 This makes people think that cranberries grow in water, but they actually grow in very sandy and peaty, acidic soil. Commercial cultivation of cranberries began in 1816, and growers found that a well-tended plant can live for 150 years or more. British soldier lichens (Cladonia cristatella) are very small and are usually hard for me to see but in this case the light background made it easier. I found them growing on an old white pine stump. 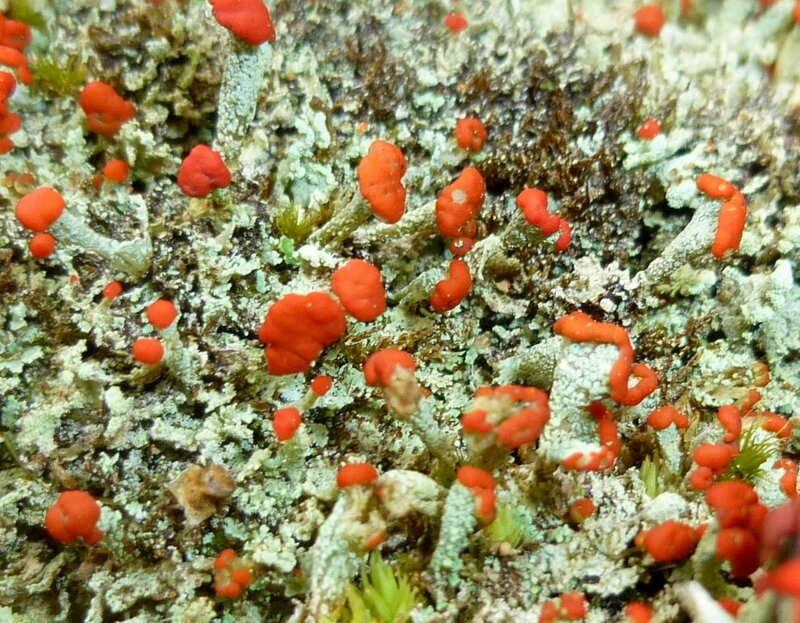 The bright red “caps” are where this lichen produces its spores. 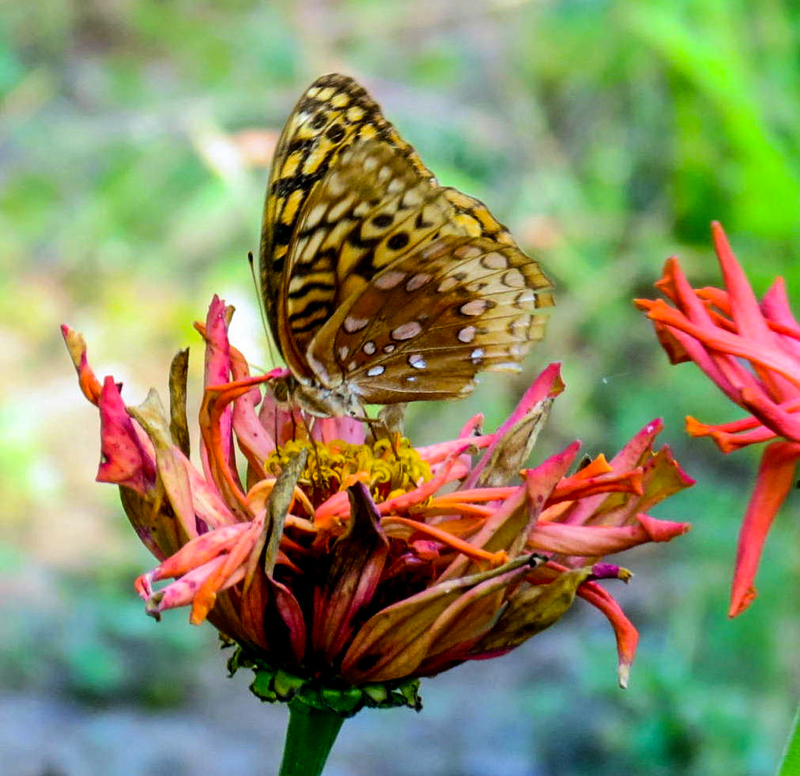 I wanted to end this post with a red cardinal or a robin but I didn’t see either one, so the reddish splotch on the lower wing of this spangled fritillary will have to do. I found it getting everything it could out of this nearly gone-by zinnia one recent sunny afternoon. I hope this excursion into the color red wasn’t too boring. Since I rarely see it in nature it’s always exciting when I find it. Maybe next time I do a post on colors it will be on blue and purple. I get those two confused all the time. I can’t imagine what it must be like not to be able to tell red from green but you’ve certainly come up with a spectacularly bright post. My own blog has been hacked. At the moment I’m not sure if I will ever get any of it back or if I should try. I did back up but I’ve lost all my photos as far as I can tell. If you haven’t done it already please back up your wonderful blog! I’m sorry to hear about your blog and i hope you can get it back because i miss reading it already. I build each of these posts and have them, including the photos, stored offline, so if that should happen to this blog I wouldn’t really lose anything except access to the blog itself. Still, I’ll look into backing it up. I hope you can figure out how to get yours back. I’m sure that I’m not the only one who will miss it. I love red foliage and fruit. Sumac has one of the best reds, I think. I agree. It’s hard to beat sumac in the fall. Really nice Allen! I like the first picture and the rose hips! I am surprised you still have color since it has started to get really cool! Our local news said that our temperatures are going to fall everyday starting tonight thru next weekend and by Friday out temps are suppose to be freezing. Thanks Michael! We’ve had 2 or 3 light frosts so far but nothing serious yet. I’m surprised that they say you’re going to cool off. The say we’re going to warm up as the week goes on. It sounds backwards! I have been wondering why I see so few jack-in-the-pulpit seed heads in our woods. I found three this year and that was a record! The jack-in-the-pulpit plant is quite prolific and our woods as are the deer and squirrels. Now I know who is eating them. Thanks. You’re welcome Jim. I’ve heard that jack in the pulpit berries are just like candy to a deer. Thank you Sue. When it comes to decorating I stand aside and let someone else make the decisions! It’s a good thing your husband isn’t a painter. I tried that for a while too. You sure did find some beautiful colors! Not much around any prettier than red leaves. Our oaks are just starting to turn, so there will be red leaves around for a while yet. 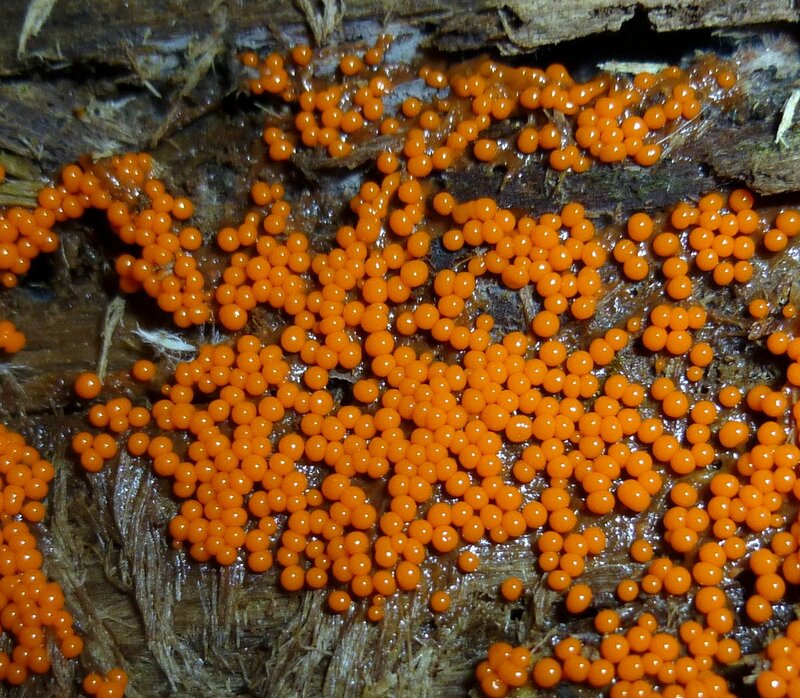 Brilliant shot of the slime mold. I stand in awe. Thank you. They can be tricky because of the low light that they grow in but this one was relatively easy. The light was bright enough so I didn’t even have to use a tripod. love it, of course-your eyes always see!! but the last shot is my favorite!!! Thank you Jini. Yes, they see, but not always what others see. And, you also had some great information on the slime mold and sumac galls, so I really liked this post. But then, I enjoy all your posts. Thanks Jerry! Yes, and I’m seeing it everywhere I go right now. I’m in no hurry for snow either. In fact it wouldn’t hurt my feeling any if we got a few inches at Christmas and then didn’t see any. I took that long shot of the slime mold for you so you could see what they look like from a distance. You often see something that looks like a colored smudge on a log or stump. Also, they are always on the side away from the sun. my brothers are red/green deficient. sounds like you? it’s funny sometimes. sometimes not – like when one got a ticket for parking in red. it didn’t look red to him! beautiful, beautiful photos. drinkin’ ’em in! Thanks Shana. I’m not sure if that’s what my kind of colorblindness is called, but it sounds like it. Red can look orange, brown, and even green and green can look brown and sometimes yellow or orange. I know what your brothers are going through! I too, have to be quick to find Lords and Ladies berries before they are eaten. I am becoming more and more amazed by what you tell me about slime moulds. Somehow, I equate their behaviour with intelligence but without a brain how can this be? How do they do it?! A real mystery of life to me. Thank-you for another beautiful and informative post. Thank-you for that link – really fascinating. You’re welcome Clare, I thought so too. I loved your excursion into the colour red, always a pleasure to look at red in nature. Thank you Susan. It is great to be able to see it. Thank you Julie. Slime molds are one of the most fascinating things in nature, in my opinion. How they do what they do is a real mystery. I hope you’re enjoying your reds as much as I am ours! Tis the season of red! Love the staghorn sumac berries, I had no idea you could make a lemonade-like drink from them. Yes, and according to what I’ve read it tastes just like the real thing. There are many recipes for making it online. The blog was the opposite of boring and was such a pleasure to join in with your enthusiasm. Thank you. I’m glad that you liked it! Our neighbours have a gorgeous ivy trained up their wall. It is just now going into its Autumn splendour before the leaves turn brown and drop off. Blazing red climbers can be beautiful thing to see! I remember collecting thousands of rose hips as a young lad. We would take them to the post office a couple of miles walk away in the next village where they bought them off us for making rose hip syrup. That’s not something we come across any more but the high vitamin C content would have made it an extremely useful dietary supplement during the war years (and the decade after) when food rationing was in place. No rationing when I was young but I suppose people retained a taste for it. They say that rose hips contain 20 times the vitamin C found in oranges so they have been very useful for just the kind of reasons you describe, Jim. 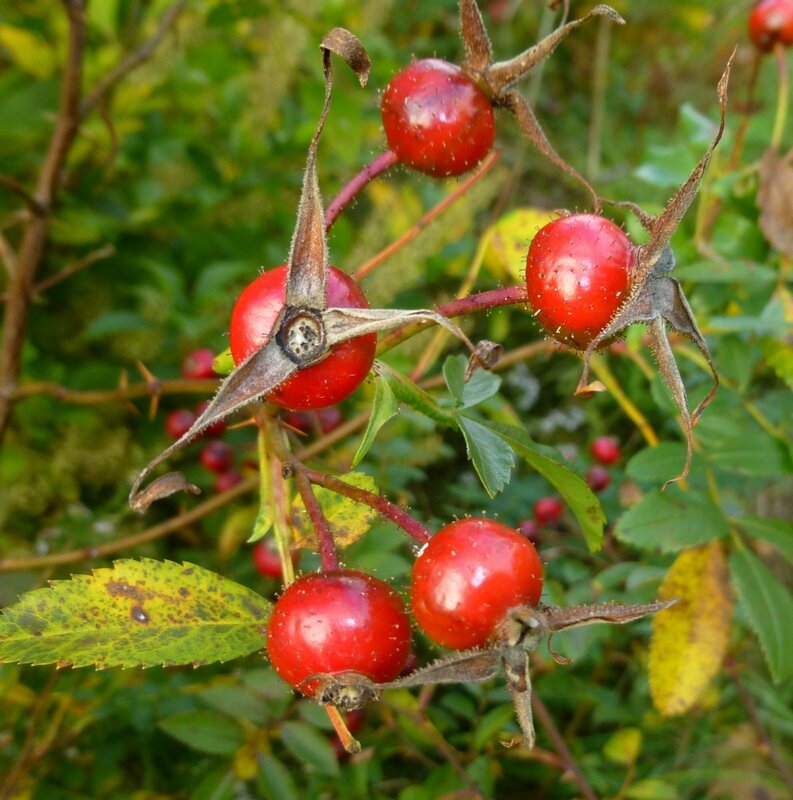 Sailors also used to use rose hips to prevent scurvy in the 1800s. I used to pick a lot of them too years ago, so I can imagine how your fingers felt! I enjoyed this excursion into red things in a nature (and really liked–and agree with–the Albers quote). You showed a pretty amazing range of leaves and berries and fruits and flowers. The ones that caught my eye this past week at my local marsh were the rosehips from the wild roses. The birds (usually cardinals) will get around to eating some of them, but they seem to be a last choice, because they tend to last through much of the winter. Thanks Mike. Rose hips are a lot sweeter after a frost, but I don’t know if birds can taste that or not. I’ve read that birds will go for the food with the highest fat content first, so maybe rose hips don’t contain much fat. The slime mold spores remind me of roe. Please, please do not wish for snow!!!! 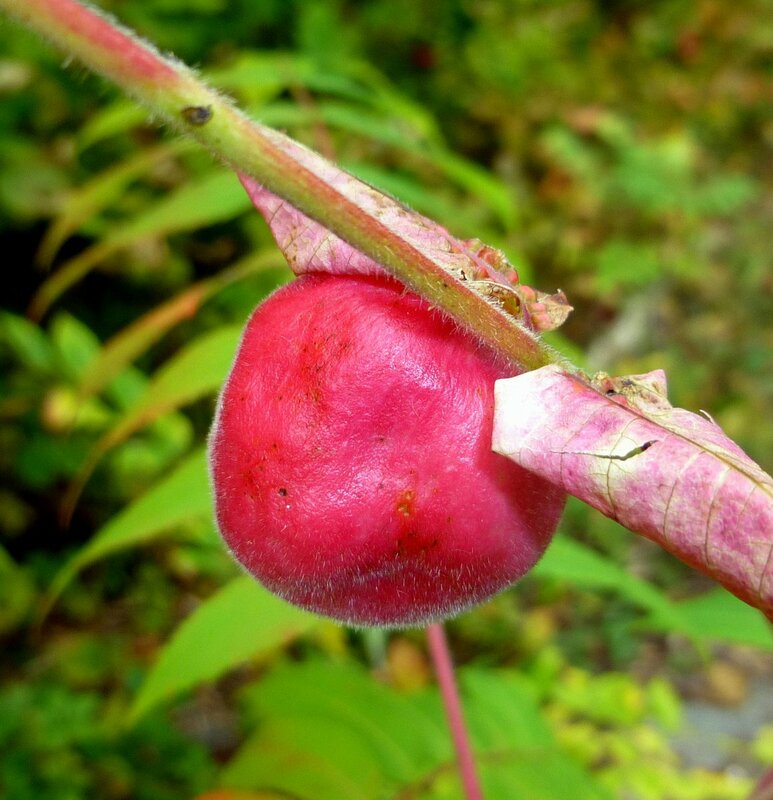 Interesting about the rose hips having a relationship with itching powder. Don’t worry Laura, I’d be the last person to wish for snow. I’m not ready to start shoveling just yet!